The small village of Kalu-Sarai lies about 500m northwest of Bijai-Mandal, and may be approached either from that way or direct from the key Delhi-Mehrauli road, about 15-km from Delhi. A rubble-built but plastered mosque here, formerly with seven arched openings in the fa�ade of its prayer-hall, some of which have now collapsed, is surmounted by a series of low domes in the Tughluq style. 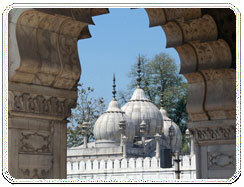 It is believed to be one of the seven mosques built by Khan-i-Jahan Junan Shah, prime minister of Feroze Shah Tughluq.